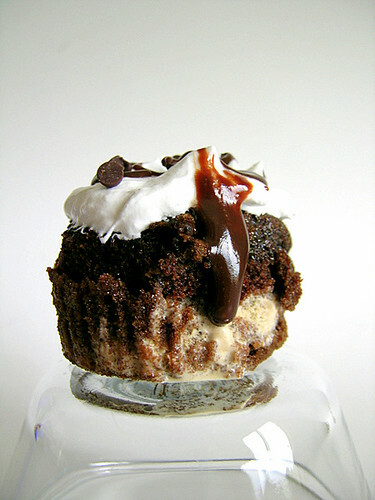 Coffee ice cream sandwiched inside of a moist chocolate cupcake; marshmallow whipped cream frosting sits lightly on top. Drizzled with hot fudge and sprinkled with mini chocolate chips. The idea for the frosting came from the latest issue of Taste of Home magazine (June/July 2009); it was the frosting for a coffee and chocolate pie. I lessened the amount from the recipe a bit, since I wouldn’t be needing as much as the recipe made. It is very light and would be a good frosting for regular cupcakes as well if you’re after something light and marshmallowy. The cake recipe I used is the same from my s’mores cupcakes. It is a recipe from Martha Stewart and Trophy Cupcakes in Seattle. 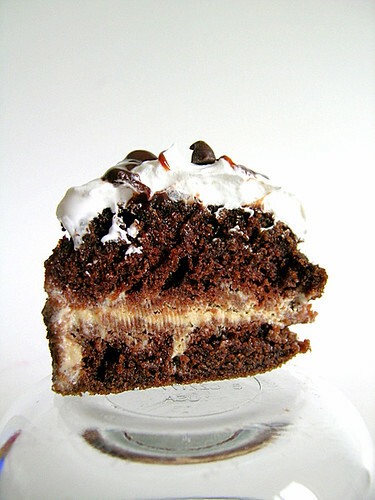 I chose this cake recipe because it was very soft and moist in the s’mores cupcakes. For my ice cream cupcakes, I divided the cake recipe in half. Keep in mind that you can use any cupcake flavor you wish to make ice cream cupcakes, as well as any ice cream flavor. I won’t post the recipe for the cake, as you can find a link to that on my s’mores cupcakes post, but I will post the instructions for assembling the ice cream cupcakes, as well as instructions for making the frosting. Ohhh my gosh I want one!